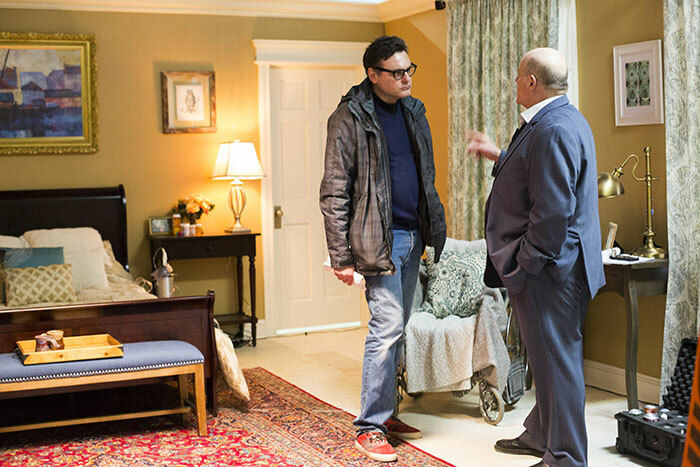 Emory professor Rob Barracano, director and co-writer of “Fran K.,” talks on set with actor Michael Ironside. The bedroom set was one of several created in Building A on Emory’s Briarcliff property. The project was a collaboration between Theater Emory, Emory College’s Department of Film and Media Studies and the Theater Studies Program, with student input throughout the process. Includes a panel discussion, Q&A and reception. Tickets are free, but reservations are requested. Reserve tickets here. Emory’s Briarcliff property is one of Atlanta’s most sought-after locations for film and television production in the city’s newest booming industry, so the hustle and bustle of yet another film shoot in late March was not unusual. But this was not your typical Hollywood production. Working under the production moniker of Screen Stages, the shoot was an unprecedented collaboration between Theater Emory, Emory College’s Department of Film and Media Studies and the Theater Studies Program. 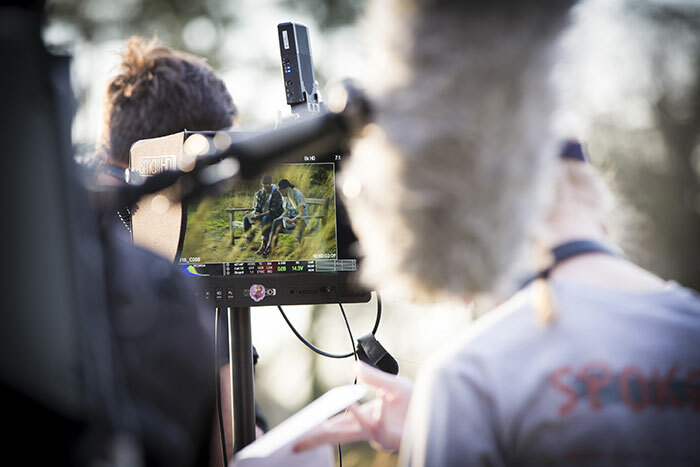 The production was also a once-in-a-lifetime opportunity for students to work on a film that was both a learning environment and a fully professional set where expectations were high and the hours long. Inspired by Mary Shelley’s “Frankenstein,” and created in part for Emory’s university-wide celebration of the 200th anniversary of Shelley’s seminal work, “Fran K.” is a contemporary reimagining that wrestles with questions of ethics in science and what does and does not make a person a monster. The idea to take on such an immense project initially grew out of a class collaboration, says Lisa Paulsen, chair of Theater Studies. On one of the final nights of shooting, the set had all the markings of one of Atlanta’s many film shoots. The first floor of Building A served as basecamp for production, complete with junk-food laden craft service tables and work spaces covered with computers and call sheets — everything necessary for wrangling a crew of more than 50 people. (Building A has been featured on screen before, most notably as the site for the Hawkins National Laboratory in the Netflix hit “Stranger Things”). Further within the building, Emory students with headsets moved between basecamp and various rooms converted into strikingly realistic sets: a jail, a laboratory, a bedroom. The 20 students serving as interns merged seamlessly with the professional crew, including five Emory alums. Student interns witnessed the massive organizational effort behind film production, moving from location to location to get all the necessary shots. In addition to the Briarcliff property, Emory’s Visual Arts Building (where students helped build a set mimicking a residential hallway) and a local convenience store served as filming locations. Students were even brought in on the creative process by Barracano and production designer Sara Culpepper, a lecturer in Emory’s Theater Studies department and resident scenic artist with Theater Emory. Alivia Burdette 19C, a theater major from Hampstead, Maryland, served as an art department production assistant on set. Students were also involved in helping shape the script. 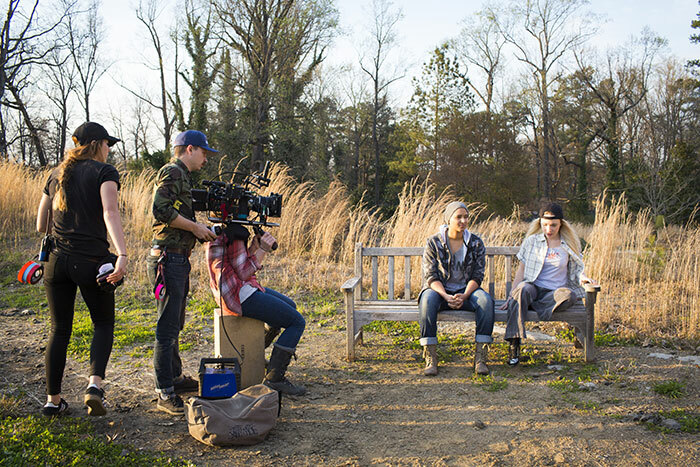 Professional film sets are famous for their grueling schedules and rigorous work environments, a fact that worries Barracano when imagining a future for the young filmmakers he instructs at Emory. “Fran K.” was made possible with funding from Theater Emory, Emory Film and Media Studies, and Friends of Film and Media Studies. Michael Ironside’s residency was funded with additional support from the Donna and Marvin Schwartz Foundation Artist-in-Residence Program. Screen Stages, a collaboration between Theater Emory and Emory’s Film and Media Studies, presents the premiere of “Fran K.,” Sunday, April 29, at 2 p.m. in White Hall 208 on the Emory University campus. The screening is free and open to the public and will be followed by a panel discussion, Q&A and reception.